Saildrone company founder Richard Jenkins and an assistant make last minute checks at the Neah Bay marina before sending the unmanned vehicle to sea. They're life-jacket orange, they're robots and they're capable of sailing the high seas without human intervention. On Tuesday the National Oceanic and Atmospheric Administration and a private contractor launched a pair of unmanned “Saildrones” in Pacific Northwest waters for the first time. Their summer-long voyage to collect fish data will stretch from Vancouver Island to California. The oceanographic drones sailed from the marina in Neah Bay, Washington. The Saildrone operators will be collecting data to help set future fishing seasons and quotas. The federal government wants to see whether oceangoing robots can augment fishery surveys now performed by expensive and infrequent manned cruises. A California-based company makes the Saildrone. Business Development Lead Nora Cohen said the 23-foot long oceangoing robots can follow a remotely-programmed course for up to a year at a time. "They don't require any fuel. We use wind for propulsion and solar power to power the sensors,” Cohen said. “It means that we're able to go places where you don't really want to send people, go places that are too far to send people and go into weather that you really don't want anyone ever to be in, and be able to send back measurements." The unmanned vessels' mission in the Pacific Northwest probably won't be that gnarly. Cranes lowered the two drones into Neah Bay on a perfect day for sailing. These ''Saildrones,'' seen right before launch Tuesday, will cruise the Northwest coast. They are currently off of the west coast of Vancouver Island where they will begin a long series of survey track lines. They will cover the full outer coasts of Washington, Oregon and California over the next 100 days or so. The primary mission is fishery stock assessment—where and how many sardines, anchovies, mackerel and Pacific hake are out there. Hake is one of the West Coast's most valuable fisheries. The white flesh is commonly exported or processed into surimi, aka crab substitute. NOAA Fisheries supervisory scientist in Seattle Larry Hufnagle said a traditional big NOAA research ship-based survey costs around $25,000 per day. By comparison, one Saildrone runs $2,500 per day. The Saildrones are packed with about 20 instruments from the top of their masts down to the bottom of their keels. The fish finder is called an echo sounder. But there is one thing the Saildrone can't do that humans can: cast a net to catch and positively identify the fish detected below. Hufnagle doubts the robots will the take anyone's job away. "They are definitely going to work hand in hand,” he said. "They're going to give us additional data, not replacement data." Cohen said human operators will monitor marine traffic around the Saildrones 24/7 in case passing vessels missed a U.S. Coast Guard Notice to Mariners. That notice asks captains to keep 500 meters away from the robot vehicles. Cohen said Saildrone, a venture capital-backed company based in Alameda, California, expects to launch a total of 11 of its seagoing robots to survey different water bodies for NOAA this year. The Bering and Arctic seas, coastal California and Gulf of Mexico will be the locations of additional missions. Separately, Saildrone has a contract underway with the Australian government in the Southern Ocean. 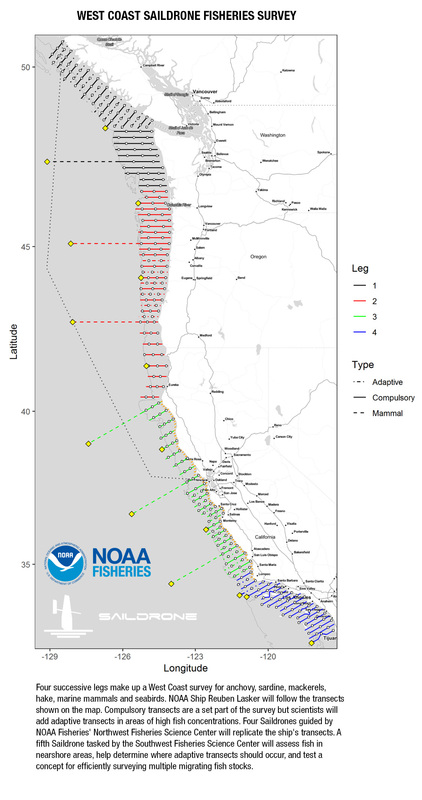 In the case of this year's West Coast fisheries test mission, the big NOAA research ship Reuben Lasker will come along later and duplicate some of the transects for comparison. NOAA typically uses a large ship for a hake survey every other year and does anchovy/mackerel/sardine surveys once annually. The Canadian Department of Fisheries and Oceans is collaborating on the Pacific hake survey using the Saildrones because hake are managed under a bilateral treaty. ”I know for ocean research now that we would definitely like to have more robotic vehicles out there," Meinig said dockside Tuesday. He foresees practical applications for the weather and water chemistry sensors on board the Saildrones. Real-time observations of wind, temperature and sunlight from the seagoing platforms could augment the few existing offshore weather buoys to improve weather forecasts. Meinig is also keen to add instruments in the future to measure climate change parameters, specifically "carbon flux." That refers the exchange of carbon dioxide between the air and the ocean. Carbon dioxide is a key global warming gas. 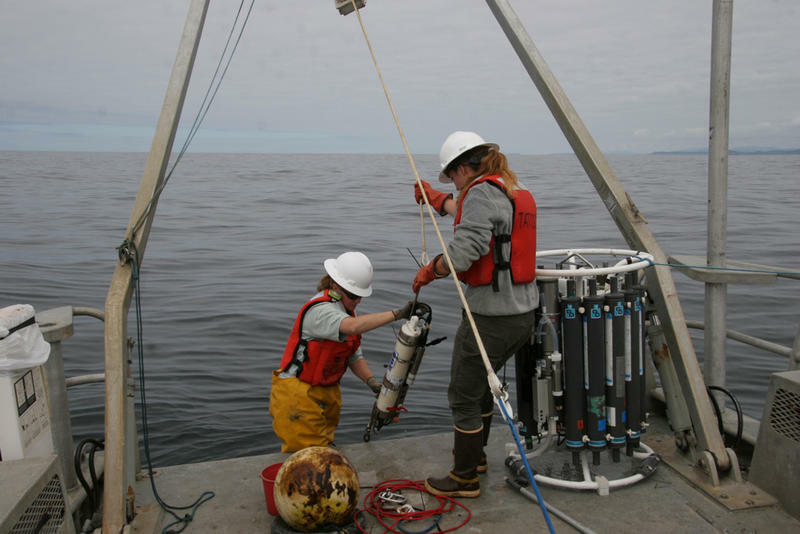 ”We measure both the CO2 content in the air and then we look at either what is coming out of the ocean or going in," Meinig said. "Understanding that dynamic will help us more with problems like ocean acidification, or carbon sequestration in general, or dissolved oxygen." People who catch fish for sport or for a living often eagerly await the day when fishing season opens. 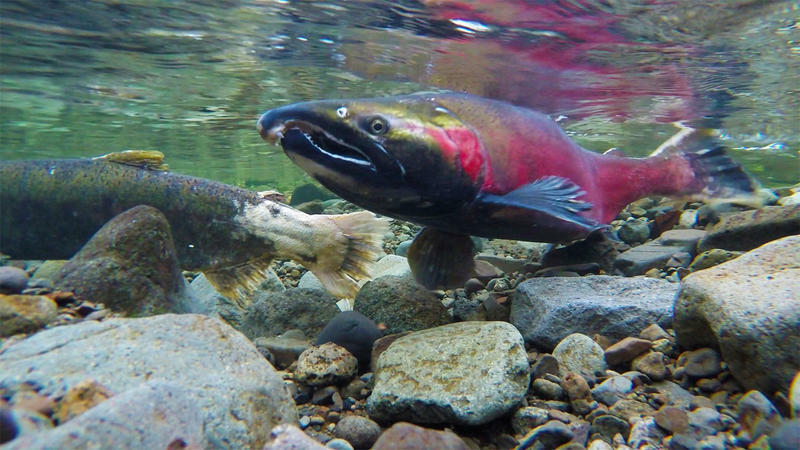 But a new study from the University of Washington argues the timing of fishing seasons needs to be reevaluated, especially in light of climate change.